I was browsing around the web the other day and was thrilled to stumble upon the "Tree Circles" photography series from artist Adriene Veninger. You may recall that I've had my eye out for something quite similar for awhile now. There are 27 photos in the collection, and any one of them (or, ideally, two or three) would be a perfect nod to the style and substance of our old log house. I think they are so interesting, and also beautiful in their simplicity. I scoured the web in vain looking for prints for sale, and I even emailed the artist herself for info on buying one. Her website says "edition of ten" so I'm guessing I'll be out of luck in getting a single print. But that's okay. I've enjoyed admiring them, even if only online. The hunt continues! 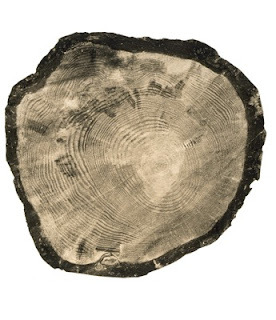 My dad has a great story about finding a finial for his old woodstove after years of hunting, so I'm holding out hope that I'll find my cool tree ring print someday, whether it's a neat photo or a relief print or something else altogether. Is there any special item that you're hunting for lately -- or even for the past several years? UPDATE: Adriene returned my email yesterday and offered the following information. "Yes, I do sell photographic silver prints of my work. All photographs are toned silver prints. 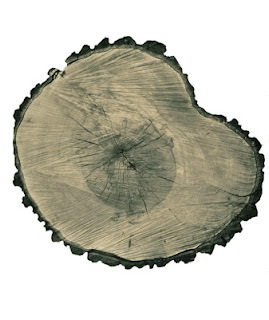 The tree circles are produced in small editions of ten. They cost 2600.- unframed." These photos are great. Design*Sponge just posted a great twig DIY that I can't wait to try. Unfortunately it's hard to come across logs in a city. I saw that twig DIY too. Very cute! Logs would be hard in the city... but twigs, though, twigs you could find! You live in Providence right? What section? On the East Side there is Blackstone Blvd, which is lined with trees. Take a serrated knife when no one is looking and saw off a few small branches! Such a simple concept but beautifully done. How did you find them? 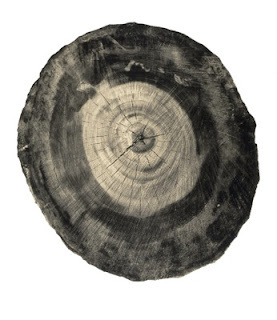 I could always find a log, take a high quality picture of it, and have you pay me only $1250 for a print! I'll even write 1 of 1 on it. Matt - If you know how to take high quality pictures, please teach me! I'll pay! Thank you for your kind words about my work. Feel free to contact me for price information.